It was an early, before any trace of light in the sky, start on the morning of the second day in Camargue. After an afternoon in the park, we made our way around the lagoon, guided by the owner of the hotel to a spot that should work for sunrise. He was right, but he didn’t mention the pothole ridden dirt track that we had to drive on to get there. Some of those holes were so deep, that I’m sure they had their own micro-climate. Making headway on these roads in the dark was a slow process, but we made it to the destination with some time to spare. Seeing wild flamingos in the park is an incredible experience, especially if you take time to watch their behaviour, and as they are used to people within that environment you can get very close. Seeing them out in the lagoon though, is something else, although they are a lot further away and even though the flamingos in the park are all wild and free to leave at any time, seeing them in the lagoon feels more natural. A few, in fact most of these images from this morning are very cliche, the title shot included. Sunrise over the lagoon, single flamingo silhouetted against reflection of the rising sun! On a side note: I think that the flamingo in this image looks a lot like a floating cherry. The next one of a gull flying across the sun falls into the cliche group too! There are more; I decided not to include them in this post. The next shot, also of a single flamingo in the lagoon has a simplicity to it that I love, a seemingly Rothko-esque feel to it with the two distinct colours. But there is another level introduced with the contrasting silhouette of the sole flamingo in a typical stance, and the very faint silhouettes of cypress trees on the far shore of the lagoon in the background. Possible one of my favourite images from the trip. These next two images were taken at roughly the same time, one without filter, the other with. The first one 1/4 second, the second 15 seconds. Believe it or not, but there are flamingos in these shots too. If you enlarge them, you can see a row of them about a third of the way down on the right side. They are more visible on the second image. After being bombarded with cliched views of flamingos silhouetted against the glitter of the sunrise light shimmering on the lagoon, we decided to head off to look for another location. Further around the lagoon we spotted a small flock. Actually it was Jiri that spotted them, I think that I was still looking out for potholes. The sun, still low in the sky was filling the scene with a beautiful light and the dark clouds in the background added a perfect contrast to the colours of the water, flamingos and reeds. 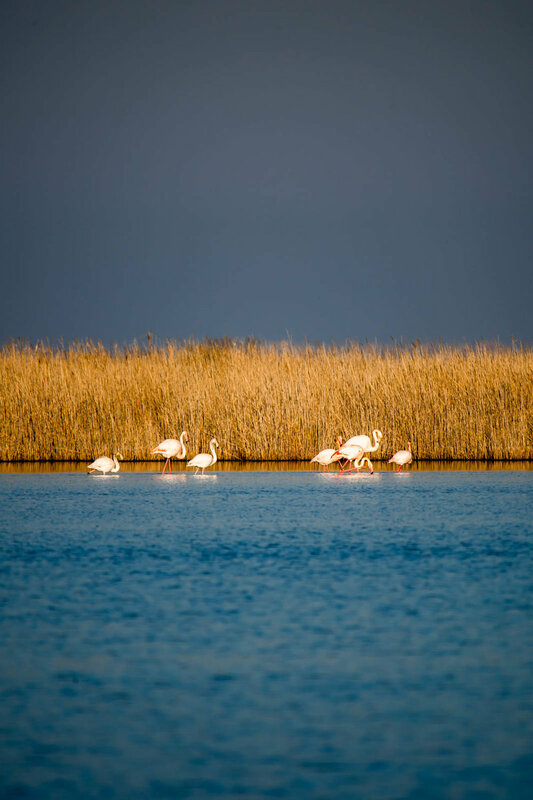 There will be another Camargue post soon as I went again soon after this trip.